Recently, my husband and I made our way to Seattle for our anniversary. I blogged about it over on my photography blog. 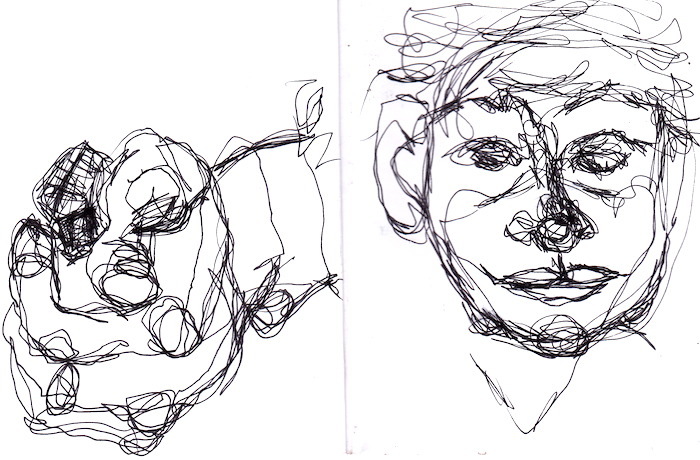 While on the train, I did some quick sketches of his hand and a portrait of a stranger. I don't often draw strangers that are around me, but Lynn Cohen's amazing urban sketching has inspired me to try this more. Great sketches! I'm like you, I don't tend to draw strangers so it's great that you've given it a go! Looks like happy trains sketching, lovely fun pieces Juana! Cool! Sketching in a moving vehicle is something I don't get to do very often. Happy Sunday Sketches!